The Chicago Cubs needed to beat the New York Mets Wednesday night at Wrigley Field for a chance to go to the World Series. CHICAGO (WLS) -- The Chicago Cubs' bid for a trip to the World Series was squashed Wednesday night after their 8-3 loss to the New York Mets. 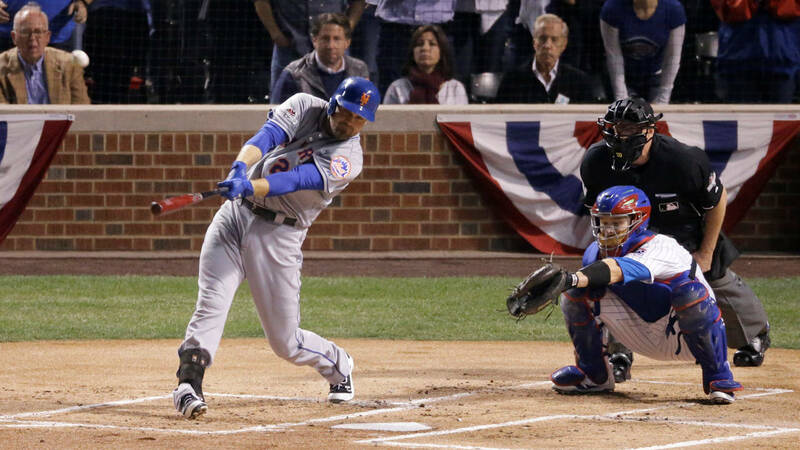 The Mets swept the best-of-seven series in the first four games to win the National League pennant and advance to the World Series. About 40,000 attended Game 4 Wednesday night at Wrigley Field, but as the Mets widened their lead disappointed fans started to leave the stadium at about 9 p.m. By 10 p.m., street cleaners were out and police opened Clark Street to pedestrians and vehicles. A comeback after three losses was possible for the Cubs. The 2004 Boston Red Sox team did it in 2004 and Cubs fans were optimistic. "When we get hot, we get really hot. We can do it," said Cubs General Manager Theo Epstein, who was general manager of the 2004 Red Sox. Earlier Wednesday, the Mets' website briefly featured National League Championship merchandise. Perhaps some "Back to the Future" magic can help the Cubs. The 1989 "Back to the Future Part II" movie made the bold prediction that the Cubs would clinch a World Series on Oct. 21, 2015. Wednesday is also "Back to the Future" Day. 2015 marks the 30th anniversary of the trilogy that brought the future to the present. Some of the other predictions made in the "Back to the Future" franchise were on the money, including flat screen TVs and smart glasses. Self-drying jackets, shoes that lace themselves and the Cubs winning the World Series have yet to come. Stephen Schueller, a Clinical Psychologist with Northwestern University, said the team's long history of curses and failures can start to weigh down on fans. 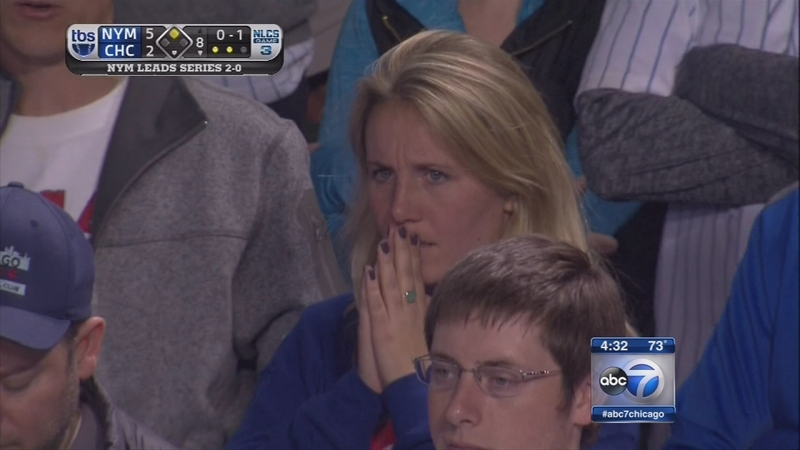 Cubs fans were disappointed by Tuesday night's 5-2 loss, but they haven't given up hope. But are the ups and downs of the season creating stress for fans? "I think, when you get to this point, expectations start to rise and it's impacting the way people are feeling about this game," Schueller said. He said it's normal for Cubs fans to be feeling extra stressed before Game 4. In fact, anxiety and disappointment are also normal emotions. Schueller adds that superstitions, about the Billy goat curse and wearing the same socks on game day, are normal coping mechanisms. "People come up with curses and superstitions to explain things they don't have control over," he said. Miguel Barriga, 24, didn't like to see the Cubs lose Tuesday night in Game 3, but seeing anything was difficult from his seat at Wrigley Field. In Seat 101 in Section 529 at Wrigley Field, Barriga's best view was of the giant column right in front of him. 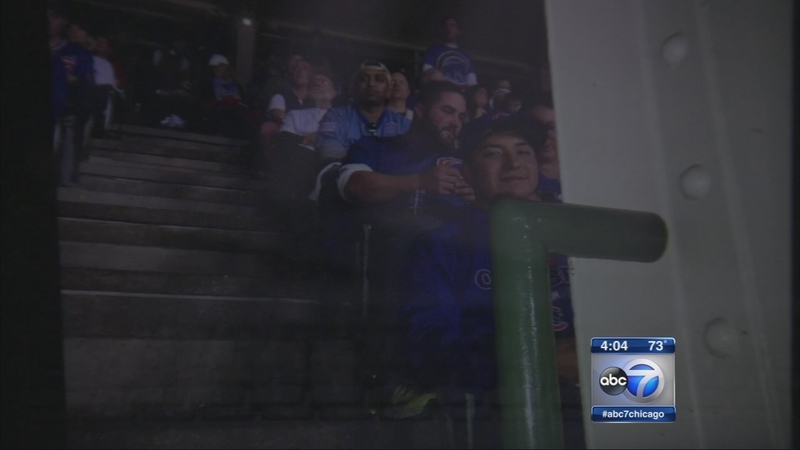 Miguel Barriga, 24, didn't like to see the Cubs lose Tuesday night in Game 3, but seeing anything was difficult from his seat at Wrigley Field. In Seat 101 in Section 529 at Wrigley Field, Barriga's best view was of the giant column right in front of him. Unfortunately, he paid $400 on StubHub for the ticket that had a face value of $85. "It was horrible I had to turn both ways in order to see what was happening on first base," said Barriga, who got the ticket as a birthday present. But like most fans these days he is full of enthusiasm and optimism and plans to be at the game Wednesday night - in different seats. Beverly Healey, a lifelong Cubs fan who now lives in Tennessee, won the team's lottery Tuesday for a chance to purchase a seat to watch Game 4. She bought the ticket and hours later was on a plane to Chicago, even though she could have sold the ticket for five times the value. "I bought the tix, didn't think of coming, but the more I thought about having the ticket in my hands, I was like I have to go," Healey said. Despite being 3-0 in the series, she still believes the Cubs can pull through. "They've won a lot of games this year, one after another, so I know four in a row is not a big deal for them," Healey said. Ray Ravera, 88, has been a Cubs fan for nearly nine decades. For the last 25 years, he's been living his dream as an usher at Wrigley Field. After retiring from his job as a mortician in his early 60s, he promptly went back to work. Well, if one can call hanging out at the ballpark "work." Along the way, he's made several friends with players. He used to watch Ryne Sandberg's kids in the bleachers. He helps direct people to their seats and gets to watch the games. He's seen a lot of baseball. "Oh, yeah, too much, I think," he jokes. Ravera isn't the oldest usher. A 95-year-old woman also works as an usher at Wrigley. City officials ask that fans be respectful of businesses and residents surrounding Wrigley Field during celebrations. Fans who need to hail taxis should head to the corner of West Addison Street and North Racine Avenue or to the corner of Addison and North Halsted Street. Limos and car services should pick up passengers along West Irving Park Road between North Clark Street and North Seminary Avenue. The Cubs are offering free remote parking at 3900 North Rockwell Street during the postseason. Free shuttle service is available to and from Wrigley Field, which begins 3.5 hours before the game begins and ends about one hour after the game ends. City officials recommended using public transportation to get to and from the game. Fans can use the Red Line to get to the Addison and Sheridan stations, which are closest to Wrigley Field. The CTA will provide extra bus service on the No. 80 Irving Park and No. 152 Addison route. Fans may also take the No. 8 Halsted and No. 22 Clark busses. Each night there is a playoff game, Yellow Line shuttle buses will operate until midnight from Howard, officials said. Fans can get the latest CTA updates online at www.transitchicago.com or by phone at 1-888-YOUR-CTA. The latest Metra updates can be found online at www.metrarail.com or by phone at 836-7000. The Regional Transportation Authority's Trip Planner is also a good resource. Visit www.rtachicago.org for more information. Chicago police said open alcohol is prohibited on the street and sidewalk. Fines can reach $1,000. In case of extreme weather, fans can subscribe to alerts at www.notifychicago.org.